When big brother comes knocking on your door it may be time to administer the Wasserman Test. Only the very old remember this classic test required in some states as a pre-marriage requirement, a blood test. A negative Wasserman meant you were free to marry. A positive Wasserman was a blow to your plans indicating that you had a potentially fatal disease, an STD type, – syphilis. Stand by! There is a new Wasserman test which is so idiotic that it works for only 24 hours, the time it takes the good folks in Florida to discover how fundamentally stupid this law really is. This latter law is not a “Green Law”, but a law based upon the purest form of legislative isolationism. After living in Palm Coast for ten years, we decided to build a pool in our back yard next to the adjoining golf course. The pool included a screened-in enclosure with locking screen doors to the outside world. This offered small protection for us from outside pool entry and related dangers. We learned there were other security issues the state required of folks who build pools. We were advised that these issues were somewhat controversial, and often really irritating to homeowners. Having been advised, we signed the papers and proceeded with construction. Nearing the end of the construction phase, it came time for a city inspector to approve the pool construction. His first question was whether the openings from the house into the pool had alarms. I told him that they had just been installed earlier in the day. This appeared to be his primary concern. We have nine possible entry points into the pool enclosure from the house: Three sliding glass doors, three windows, and a regular door from a bathroom. Each of these points needed to be “secured” by an alarm in the event that the entry point was opened without consent. The first shock from these “protections” was the ugly nature of the mechanism attached to each opening throughout the house. One of our nine devices is shown below: Imagine nine of these ugly little creatures peering back at you through every visible opening into the pool, or from the pool back into the house. One learns of the irritations only one at a time after they are installed. All nine of ours were installed in about an hour, from 8:00 to 9:00am Friday, January 10, 2014. The first irritation is their placement very close to the door handle on the sliding glass doors. They are an ugly appendage on both ends of two of our sliding doors with a wire and remote button that goes around the door when it is open. The third door is a pocket door, and required only one of these ugly devices on the side that opens. A second irritation is the temporary nature of these devices. We did not understand exactly how temporary until we started hearing screaming alarms going off randomly during the next few hours. We heard five of these alarms during the first half-day. After our first startle reaction, we had to go through the house inspecting each of the devices to determine which one had misfired. Then we needed to restore it to regular function to keep it from screaming. 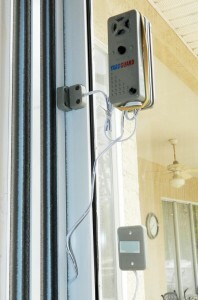 Each of the devices is battery operated, and is activated by a magnet between the fixed door or window frame, and the part that moves, a door or window. When these parts are separated a short distance, the circuit breaks and an alarm wakes the dead. There is a pass through button on both sides of each opening which allows one to operate the door or window without an alarm. A third irritation is the process required to pass through one of these doors or windows, not that anybody has ever gone through a window in our house in ten years. To pass through one of these protected openings, you must first press the pass through button. After that a beeper starts a warning beep that beeps faster and faster. You have 15 seconds to go through and close the same door or window. If you fail in this effort, the alarm goes off waking you or your wife, and the neighbors. The fourth irritation, which is fatal for the long-term survival of these devices, is that all doors and windows which open onto the pool must otherwise remain closed at all times. After going through a door, it must be closed and remain closed. Same is true of windows. If somebody goes through a window, after pressing the button of course, you have 15 seconds to crawl completely through the window and close the window before the alarm goes off. You need to tell this to all the 70 and 80 year olds’ with pools in Florida who enter and exit their pools through their windows. What assinine requirements! Surely we can give grandma and grandpa a full minute to go through a window from their pools. This restriction totally redefines the function of windows. Under this revised definition windows are no longer openings so fresh breezes may flow, but are now entry points which must remain closed at all times. They are now redefined as entry points with alarms and access buttons both inside and outside for folks who wish to enter, or exit through the window. Hopefully, this will start to make sense to a lot of folks. When having a pool party, or at any other time of day or night, all people at the party with food, drinks, or small children must close each door or window within 15 seconds. This essentially closes off the possibility of fresh breezes through the house day or night, and fresh air can’t enter the house from the pool at any time. When I read my paper beside the pool in the evening, the doors and windows must be closed. If carrying food or drink into the pool area, one hand must be continually free to press the little button and open and close the door in 15 seconds. After processing all of these idiotic restrictions in our home we received a call from the pool contractor, who gave us the exact amount of time needed to learn about, and digest the immediate consequences. We were, of course, studying our lives with these intolerable devices, which are required by Florida law, day and night, 365 days a year. We asked: “As a pool contractor, what are the consequences of not having these nasty little devices in our house?” His reply was clear: “If they are not there I can’t put water in your pool.” This reply was clear enough. He said: “In the event that you sell your house, it will protect any buyer’s small children from wandering into the pool without their knowledge.” Presumably then, this is the price we pay for one, five, or fifty years into the future, every day of the year, simply because we may sell our house to somebody with small children. Our home has been turned into a stagnant holding cell with no fresh air, and our pool is in-hospitable as a place for entertainment or relaxation, unless the doors and windows to the attached home are closed at all times. We have been told that the power behind this particular Florida law from the early 2000’s is Debbie Wasserman Shultz, a Miami Florida legislator, and current Democratic National Party Chairman. Talk about rising to your level of incompetence. This Florida law is the crown jewel of political incompetence and complete absence of human intelligence. The next question that is appropriate is “What are the consequences for a home owner who removes the battery, or simply removes all the ugly little devices from their home?” We have nine of the little devices on our portals which were armed and active for several hours one day. We were rudely awakened by them five times in the first half-day they were installed. We were told it is a misdemeanor for the homeowner to disable them. And who enforces this asinine law? One might predict that not a single home owner in Palm Coast, and probably in Florida, allows these security devices to remain active, or even on the doors or windows to their pools for a single day. When ours were active we went to lunch. When we returned one of the nine was sounding the alarm with nobody in the house. One of the initial comments of the building inspector was that these installations were only temporary. He observed that if we had permanent installations, we would not have these temporary problems. What he did not say was that if they were permanent we would not be able to sell out house to anybody, ‘cause nobody in their right mind would buy a house with these nasty little devices that worked. Unfortunately, our politicians, essentially in both parties, primarily enact laws that apply to others. In most cases they manage to exempt themselves from the same, idiotic consequences. This law in Florida recalls a grandson’s favorite saying: “Never underestimate the power of idiots in large numbers.” Debbie Wasserman Schultz certainly qualifies as chief among Florida’s legislative idiots, and she is not alone. The Wasserman test referred to initially works the same way in Florida. If the Wasserman test comes back positive, run from big government for your life. A positve Wasserman is the mark of insanity based on this ugly Florida State law. Republicans are not exempt from this disease which has reached epidemic proportions in our great country. There is no possibility that our Florida legislators actually live with these devices in their own homes for more than 24 hours while their pools are being filled with water. In Florida everybody exempts themselves from this law after 24 hours. The smell of this Florida law is fatal. Thanks, Wasserman positive!